The plums grinned at me under the promising-but-intimidating sign that read “on sale.” They screamed to be purchased and ripened and baked until, finally, their demands would subside. Some people eat plums raw, allowing juice to wantonly drip down their chins. I, on the other hand, cooked those suckers into sugary submission. 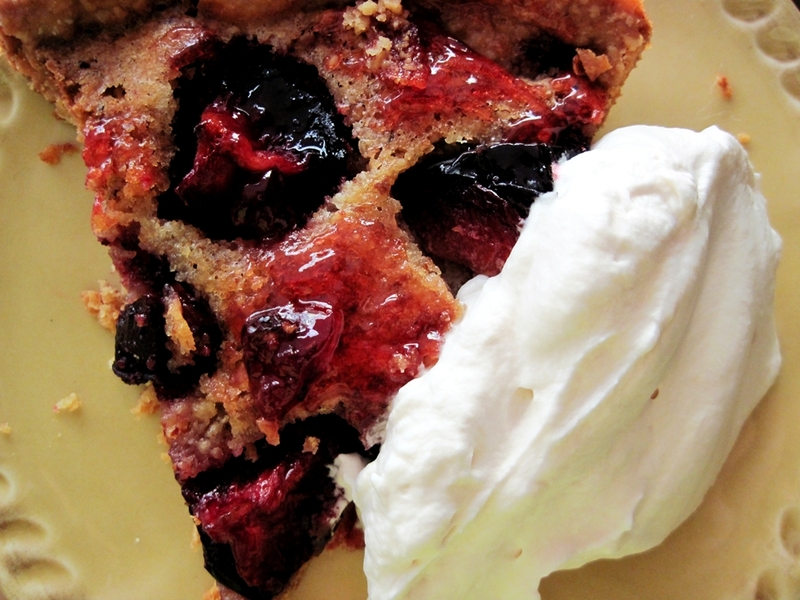 Still, this tart popped out of my oven begging to be topped with whipped cream. I had no choice but to concede. John Edwards and Tiger Woods agree–tarts are difficult to ignore. When topped with whipped cream? Well, you know what’s next. 1) Preheat oven to 375°F. Combine first three ingredients in processor. Using on/off turns, cut in butter until mixture resembles a coarse meal. 2) Mix 2 tablespoons ice water and vanilla in small bowl. Pour water mixture over dough. Process until moist clumps form. 3) Gather dough into ball; flatten into disk. Roll out on floured surface to 12-inch round. Transfer to 9-inch-diameter tart pan with removable bottom. Trim overhang to 1/2 inch. Fold overhang in and press, forming double-thick sides. Using fork, pierce dough all over. Freeze 15 minutes. 4) Bake crust until pale golden, about 30 minutes (crust may shrink slightly). Cool on rack. Maintain oven temperature. 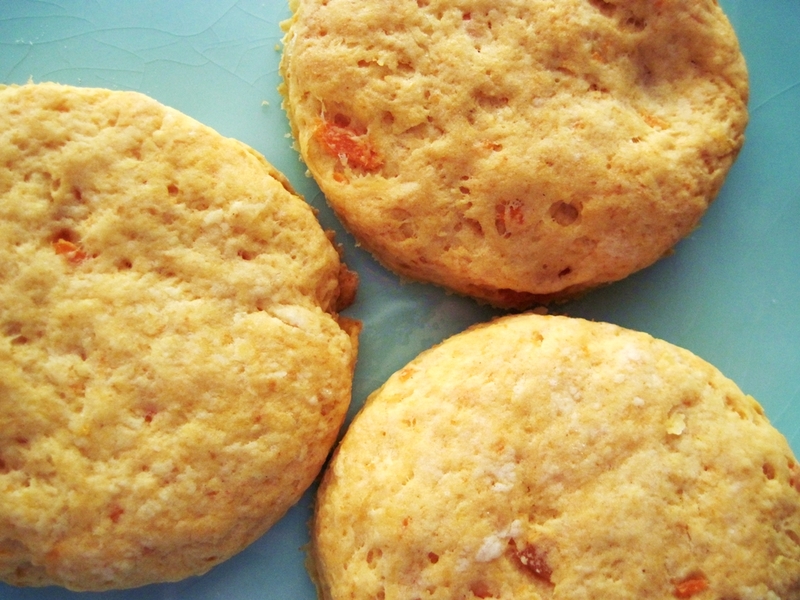 1) Finely grind almonds with sugar in processor. Add egg, butter and 2 teaspoons lemon juice. 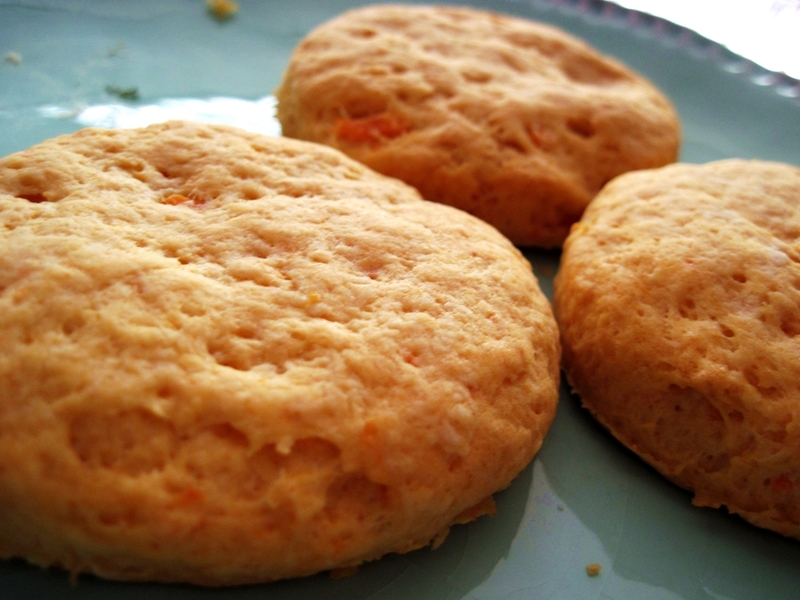 Process until batter forms. 2) Pour filling into crust. 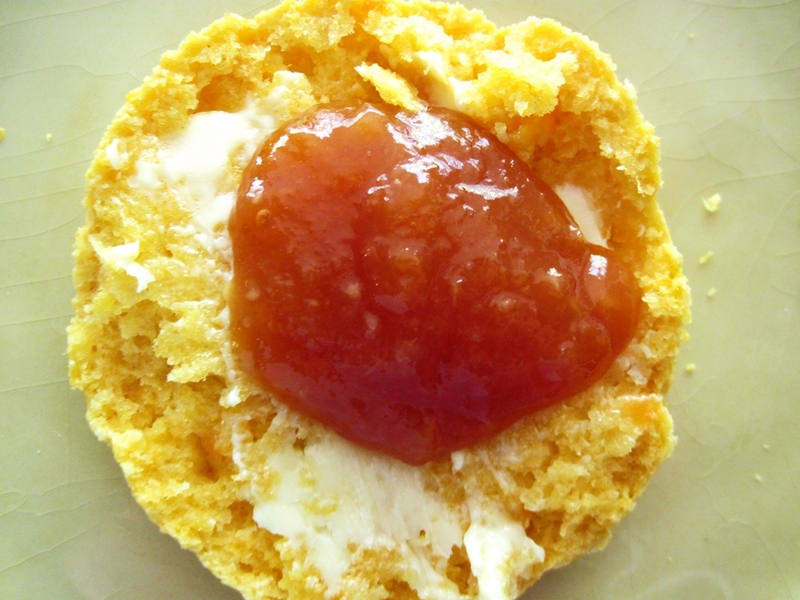 Arrange plums atop filling. 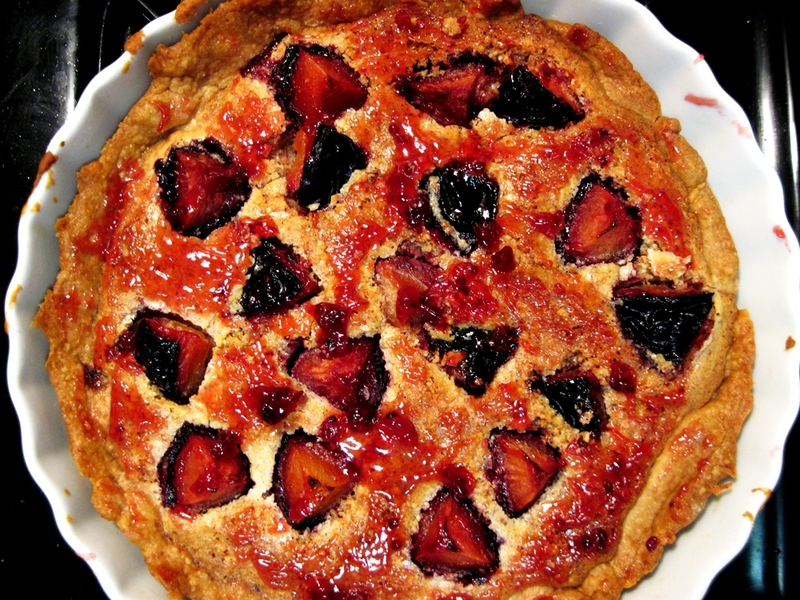 Bake until plums are tender and filling is golden and set, about 50 minutes. 3) Melt jelly with remaining 2 teaspoons framboise in heavy small saucepan over medium-low heat. Brush jelly mixture over plums. 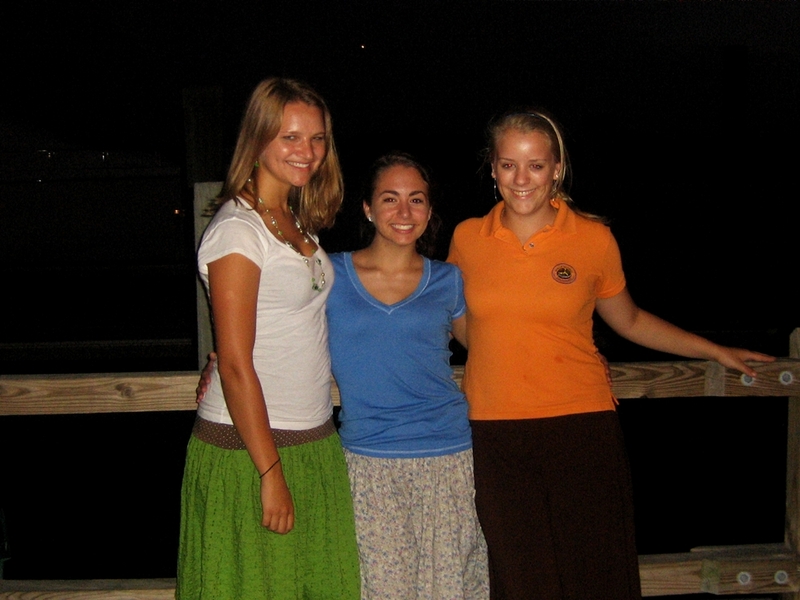 4) Cool tart. Serve at room temperature with whipped cream. I love coming home to bowls overflowing with tomatoes–their variegated colors and sizes scream potential. Particularly as fall rolls in (or, in the case of NC, drags in), I savor every last opportunity to eat local ‘maters. And when they’re from my mom’s own garden? Well, let’s just say entered my car with great alacrity. 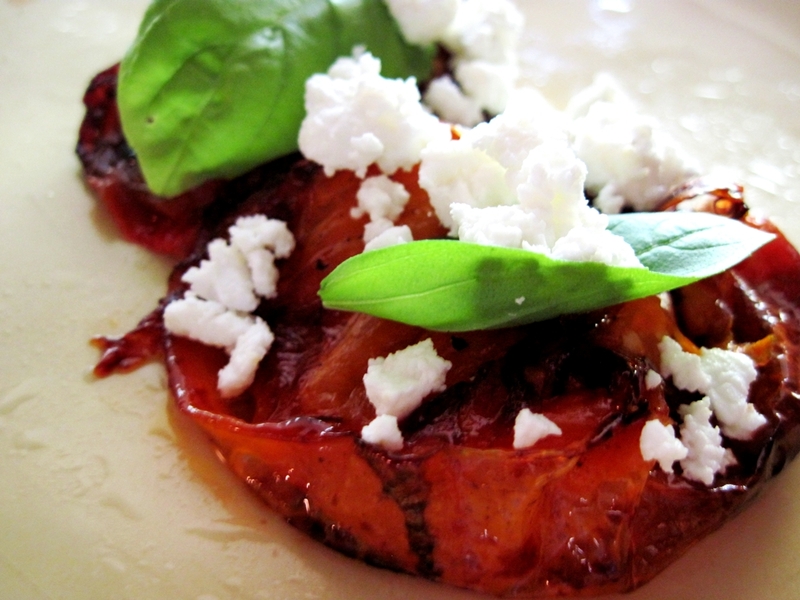 Roasted tomatoes taste simple and sweet alone or on top of salads. 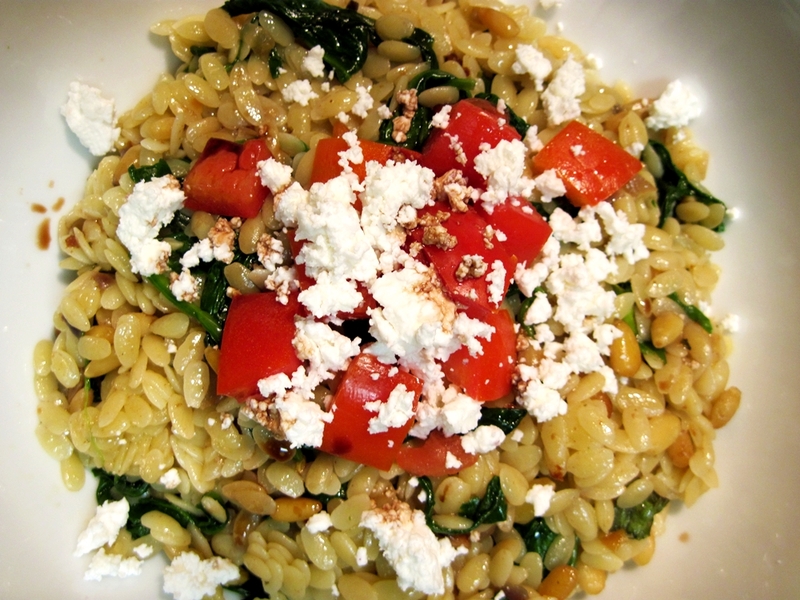 Or, as pictured above, with feta cheese and basil. Or on sandwiches. Or anything, really. 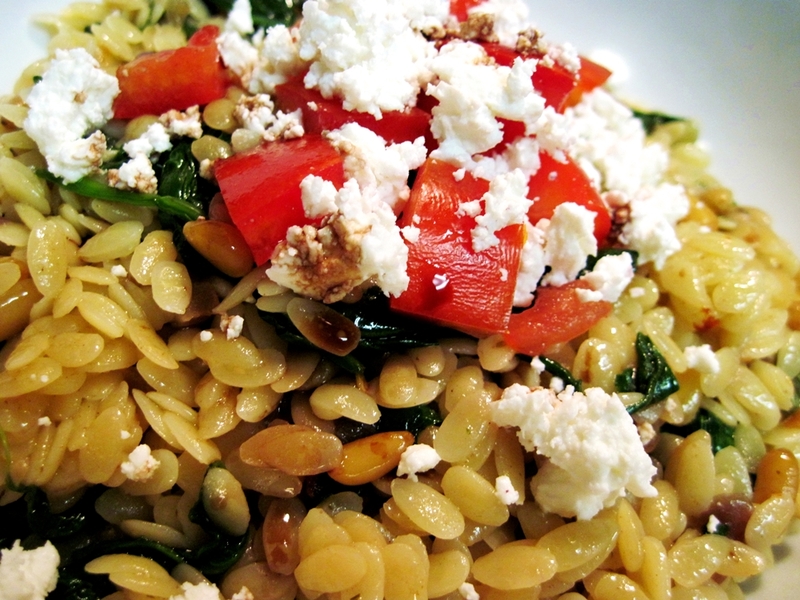 Just prepare for a warm kitchen afternoon, and you’re good to go. 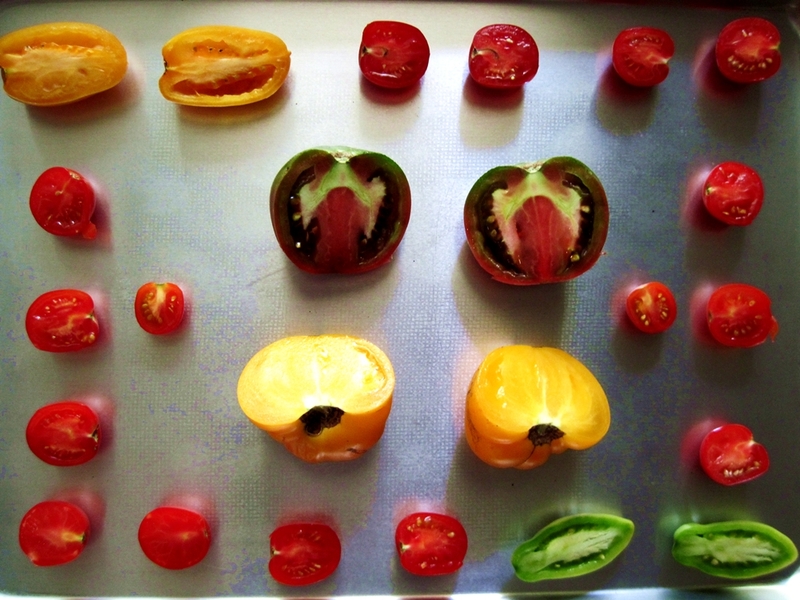 1) Slice tomatoes in half and place on cookie sheet (with a lip). Drizzle with olive oil, sprinkle with salt and pepper. 2) Put in oven at 200 degrees for 4 to 5 hours, or until roasted to desired texture. 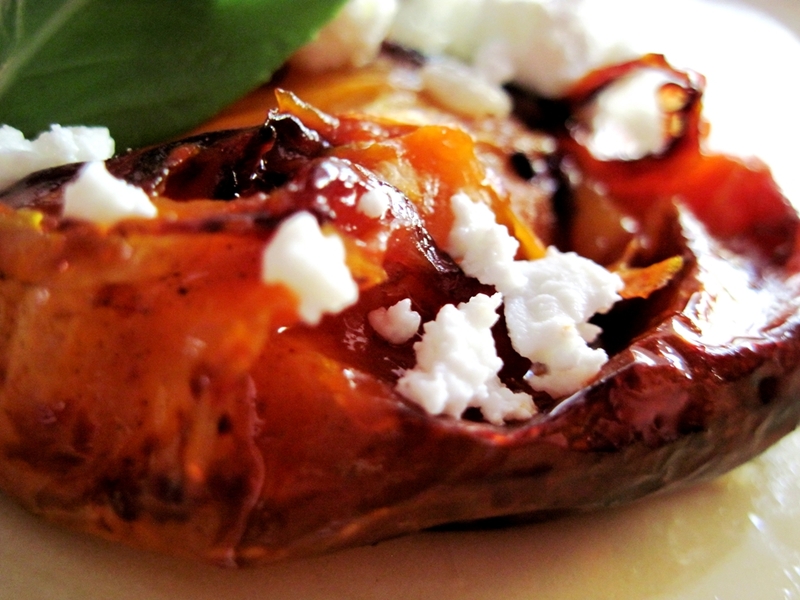 (I like ’em caramelized, but a still a bit juicy.) Done! More courgette-y goodness. Paired with pesto aioli. These chips get crispy on the outside, but stay a little bit tender in the center. What a delightful way to eat your vegetables. 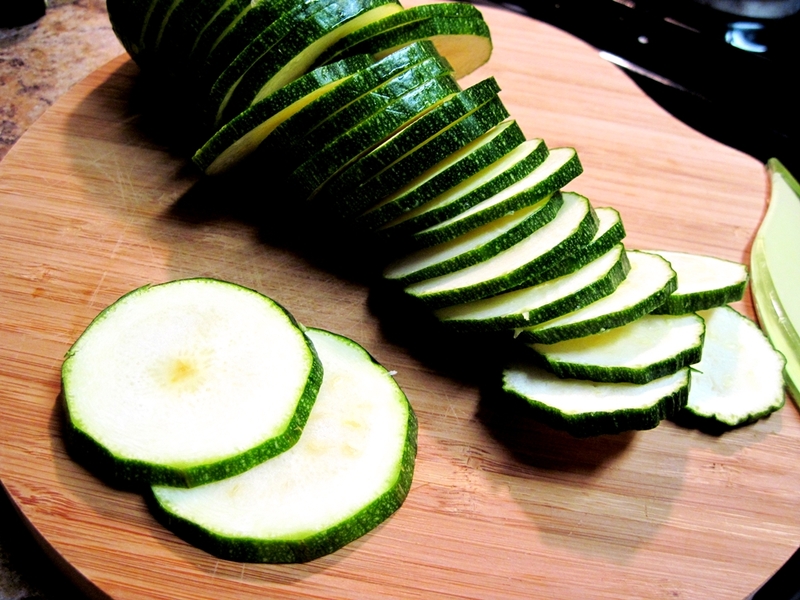 1) Wash zucchini and slice into 1/4 inch slices. 2) Mix the bread crumbs, Parmesan and seasoning in one bowl. Place the egg whites in another bowl. 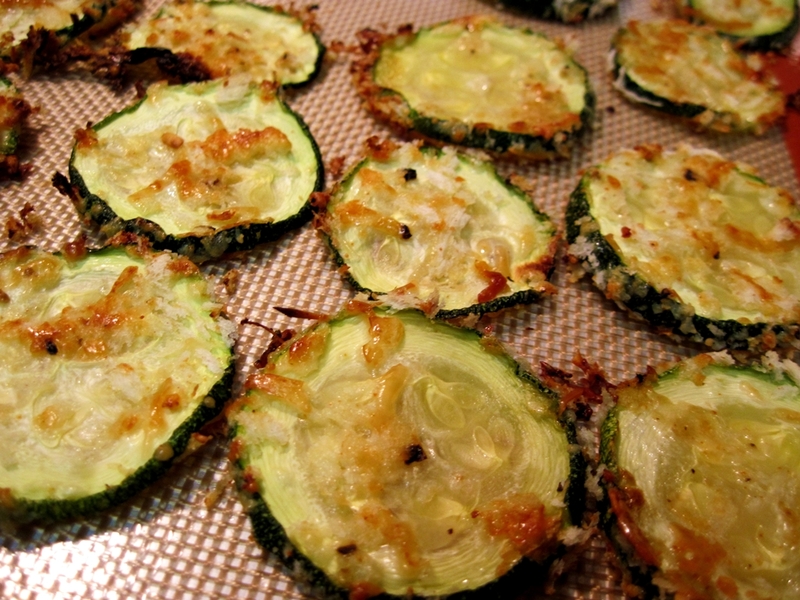 3) Dip zucchini slices in the egg whites, then dip in the breadcrumb mixture, coating them evenly. 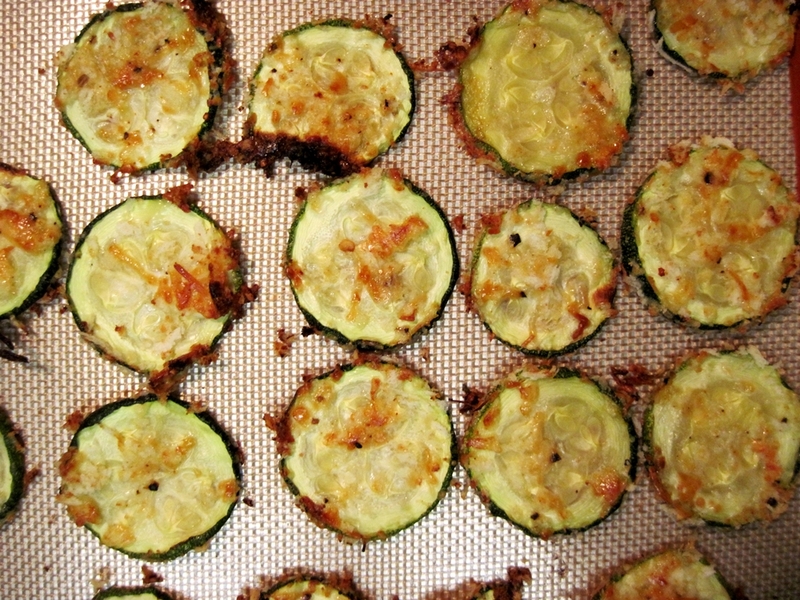 4) Spread zucchini out on in a single layer on the baking sheet. Cook at 450 degrees for 7 minutes. Turn zucchini over. Roast another 7 to 8 minutes, or until coating is crispy and golden brown. Unfortunately, this week promises to be equally demanding. At least I have these leftovers to provide me with glorious neurotransmitters. I’ma need ’em. 1) Add a bit of Canola oil to a pan on medium heat. Add the beef and stir regularly to brown. 2) Meanwhile, add some Canola oil to another pan on medium heat. Add diced onion, garlic, and jalapeño. Cook until soft. 3) Drain the beef of any excess water. Stir in cayenne pepper and oregano. Add to onion mixture. 4) Add black beans, cilantro, and tomato paste. Combine well and cover. Cook for about 10 minutes. 5) Heat a frying pan on low-medium heat. 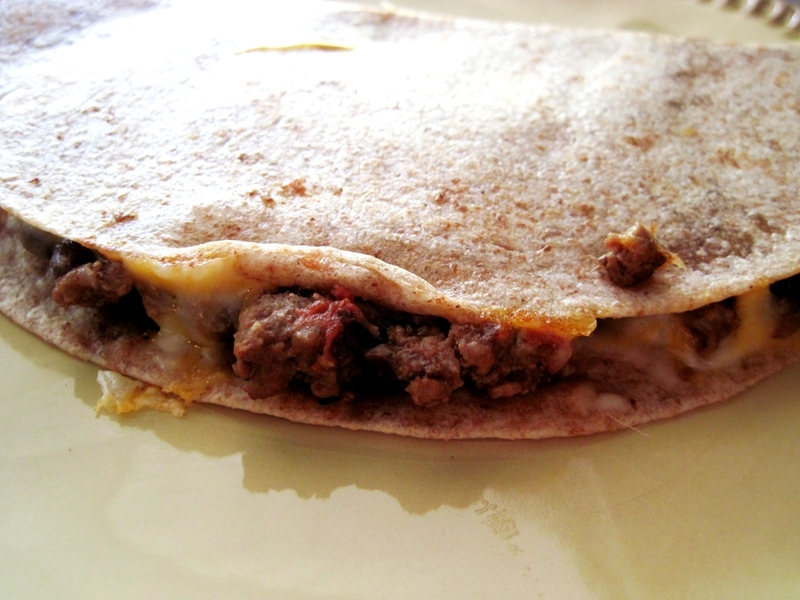 Place tortilla on pan, add cheese and let melt briefly. Top with beef filling. 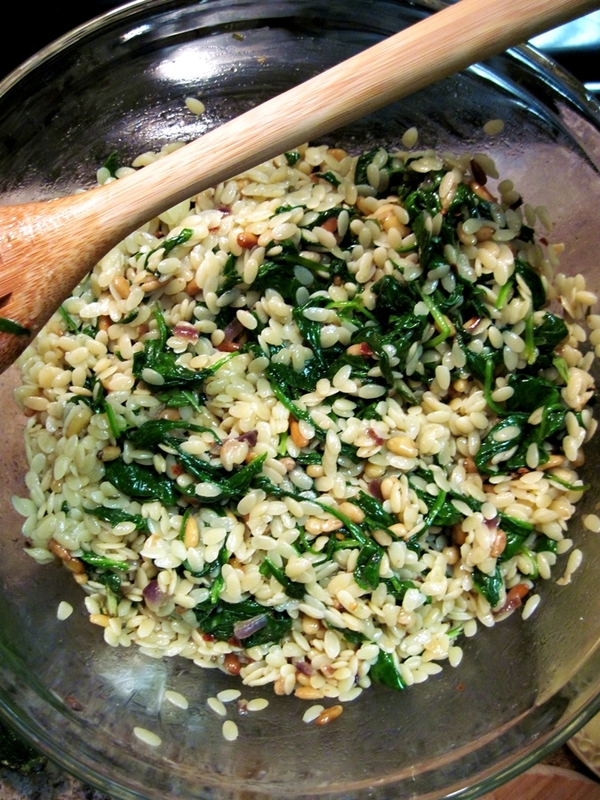 Fold over and weigh down with a heavy pan, pot, or heat-safe dish. Cook for two minutes per side. 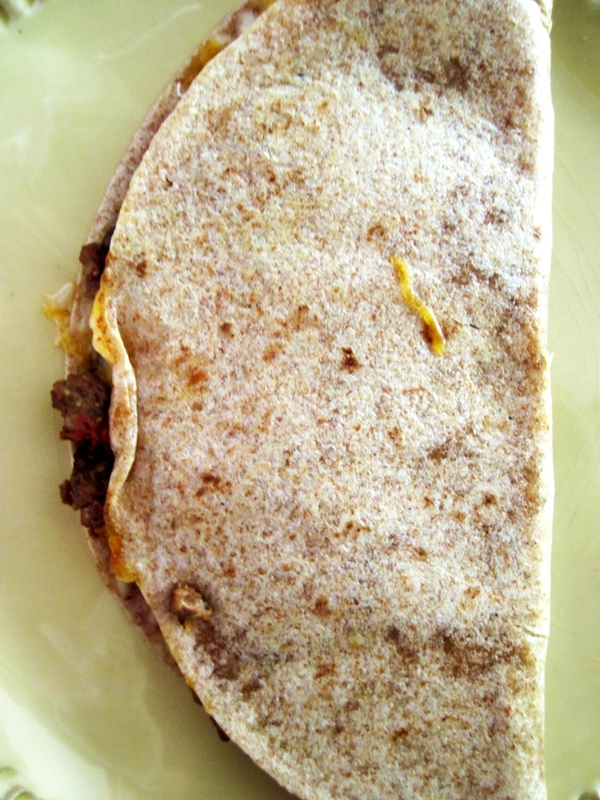 So, perhaps these are taco-dillas. In any case, they pair well with salsa and some sour cream since they’re stable enough to take cold dips. What’s your favorite Tex-Mex meal? I love spicy food and am trying to increase my repertoire. Courgettes. They sound so sophisticated, so French. Of course, when I first arrived in London, I stared dumbly down the produce section looking decidedly unsophisticated; I felt up several of the green squashes before confirming that courgettes are, in fact, zucchini. Turns out that the British are Francophiles, and I am just a woman who creeps people out while shopping for vegetables. But I digress. 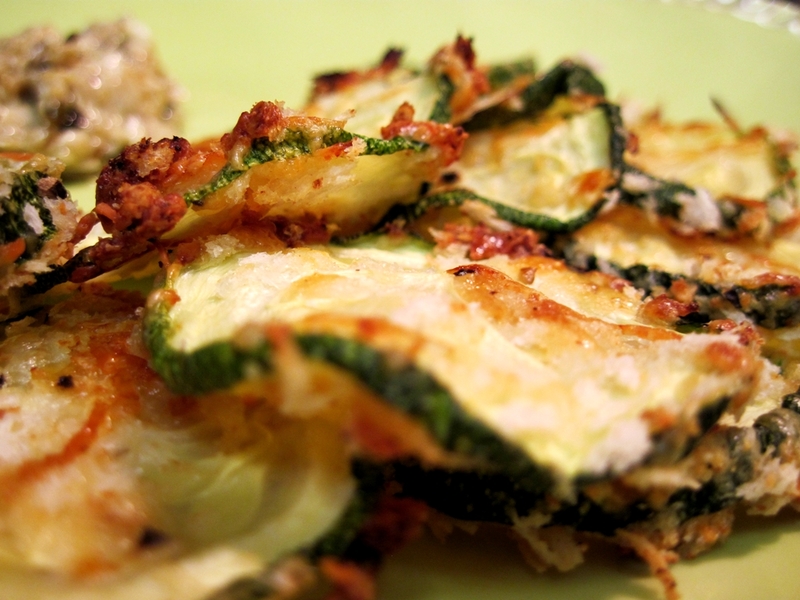 The end of zucchini season means that those lovely green squashes must find their way into new foods. I’m tired of roasting ’em and frying ’em and putting ’em in pasta. They deserve a sweet ending. Plus, chocolate courgette bread sounds so lovely. It smells even lovelier. Plus, zucchini is healthy. By extension, anything that contains zucchini is healthy. 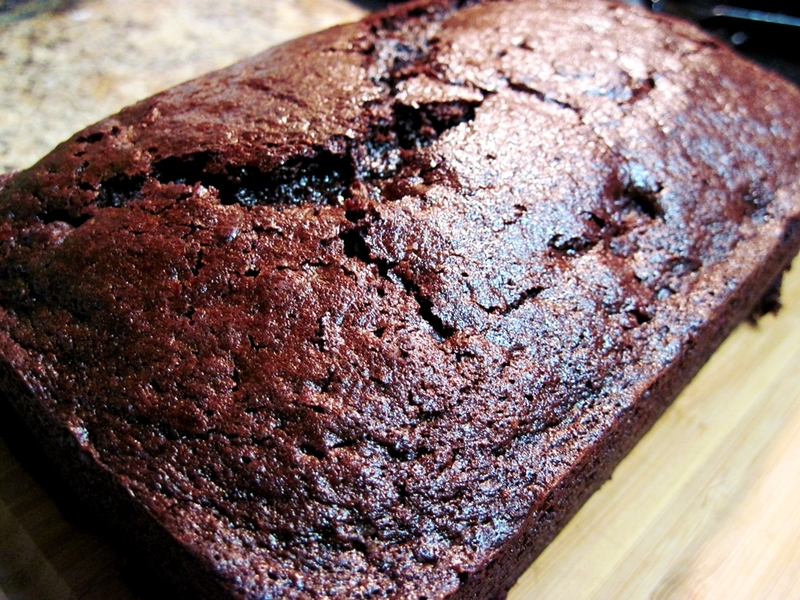 So chocolate zucchini bread is healthy. See? I have self-control. I really do. Excuse me while I go eat three chocolate chip cookies. 1) Combine oil, sugars and vanilla. 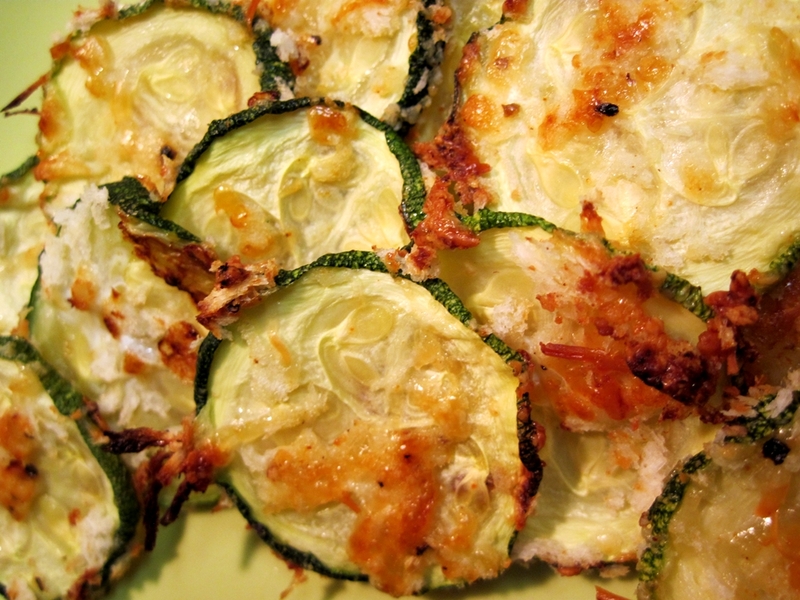 Mix in eggs and shredded zucchini. 2) In a separate bowl, sift together flour, cocoa, salt, cinnamon, baking soda and baking powder. Slowly add dry to wet. Beat until combined. Mix in chocolate chips. 3) Scrape batter into a greased loaf pan, and bake at 350 degrees for 55 minutes, or until a toothpick pushed into the center comes out clean. **Yelper and Meghan approved. Lawdy, is this bread divine.